Manufacturing Carpets since 1926 in Kidderminster, Adam Carpets has become synonymous for it's high quality wool carpets and vast colour bank. 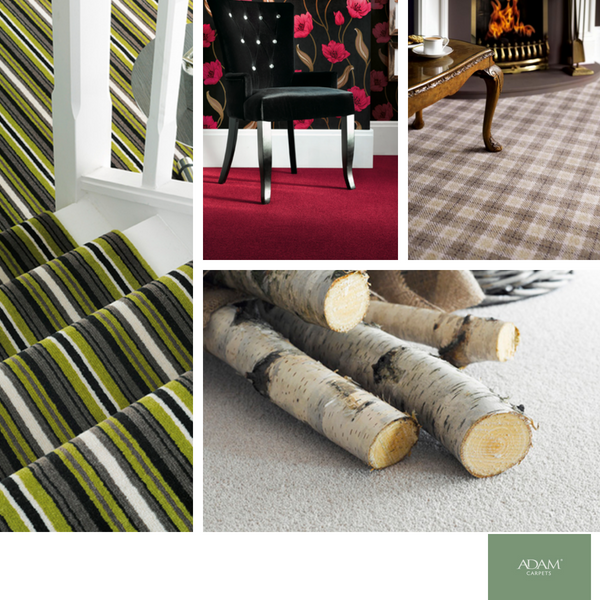 Adam Carpets extensive selection of carpets range from charming Plain Twists and impressive Berber Carpets to stunning Striped Carpets that are perfect for stairs. Visit our showroom today and see such luxurious ranges as Castlemead Twist, Kasbah Stripe and Rustic Berber. Natural- Wool is 100% natural and fully sustainable. Shearing is a crucial part of caring for sheep so there is a fresh supply available every year for the production of carpets. Insulation- A natural insulator, wool helps with reducing energy costs. Durability- Wool Carpets are incredibly hard-wearing and have 'bounce-back' fibres which results in reduced pile compression and therefore keeps it's wonderful appearance for longer periods of time. Flame Retardant- Wool is naturally flame retardant. Easy Care- The natural protective waxy coating on Wool Carpets makes products resistant to staining and will also pick up less dust as Wool is naturally anti-static.